Italian publisher. His printing press was situated underneath the arches at Rialto in Venice, and he is known almost exclusively for the publication of a series of large prints, titled Il Gran Teatro di Venezia ovvero descrizione esatta di cento delle piu` insigni prospettive e di altretante celebri pitture della medesima citta`. The first edition is undated, but it probably came out c. 1717. As originally planned, the series was to include 200 prints, but this ambition was not realized, and even the second edition (1720, 2 vols) has only c. 120 prints. The approximately 57 plates contained in the first volume reproduce paintings that hung in Venetian public buildings, including works by Veronese, Titian, Tintoretto, Palma Giovane. 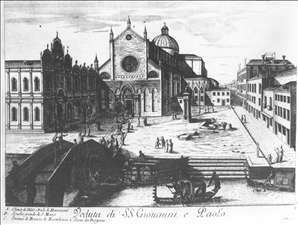 They were engraved by Andrea Zucchi, Domenico Rossetti (1650-1736), Giacomo Burri, Domenico Bonavera (b 1640), Pietro Sante Bartoli, Agostino dalla Via and others. The second volume contains a varying number (up to 66) of views of Venice engraved by Filippo Vasconi (1687-1730), Giuseppe Valeriani (d 1761), Carlo and Andrea Zucchi, as well as an unidentified monogrammist, S.F. This series was reprinted a number of times in the 18th century. See more details about "Campo Santi Giovanni e Paolo"